We are Merlin Fibreglass Flat Roofing; We are suppliers & installers of fibreglass roofing as well as installers of many different forms of fibreglass, including wet room flooring. 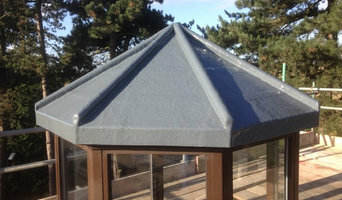 From a small repair to 100's of square metres of flat roofing in Fibre Glass, for the same price as felt or rubber, have a roof that lasts forever, seamless, durable, can be formed around any shape to make the perfect watertight seal, can withstand heavy traffic....also an antislip finish can be applied To find out more contact us on tel: 0800 3118 262 mob: 07897 466664 or visit us online today! We would like to introduce ourselves as an expanding and innovative specialist flat roofing company operating throughout the U.K. We are a family run business with comprising over 15 years construction industry experience and offer a full and complete service to the highest standards of craftsmanship. We have undertaken and completed numerous successful sub-contracts for a wide variety of clients throughout the New Build, Refurbishment & Heritage Restoration Sectors on both Labour Only and Supply and Fix contracts. Our skilled and dedicated team offer experience and support from general enquiry through to roof completion. We provide a professional and trustworthy service in which all our current suppliers have come to expect. We are current members of the Confederation of Roofing Contractors and are Approved Contractors with many major manufacturers of flat roofing materials from Built up felt, Single-ply membranes, liquid coatings and lead alternative solutions. We are also going through the process of opening a ‘Slate and Tiling Division’ to further develop our working relationships with current and new clients. We would be delighted to be given the opportunity to price any forthcoming schemes both now and in the future, and we are equally happy pricing secured projects or working on development bids at initial design stages. 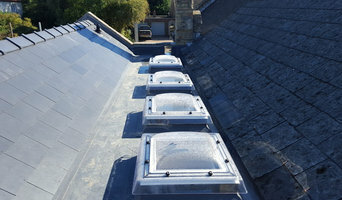 We are committed to providing the professional and high quality service our clients have come to expect, with free detailed site surveys and competivtely priced quotations. . All our roofing works are carried out by fully trained and qualified tradesmen, which enables us to cater for new builds, refurbishment, commercial and domestic contracts. All of our materials are sourced from leading manufacturers based on our clients requirements. 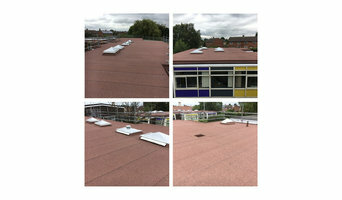 We are able to produce the best specification for terms of longevity and suitability with insurance backed manufacturers warrantees to provide guaranteed quality flat roofing systems Domestic & Commercial Flat Roofing Services All of our materials are sourced from leading manufacturers based on our clients requirements. We are able to produce the best specification for terms of longevity and suitability with appropriate manufacturers warrantees to provide guaranteed quality roofing systems. Our professional team offer a quality service from general enquiry to estimating, through to on site installation and roof completion. From start to finish , we’ve got your roofing needs covered. Ready to speak with one of our friendly team to find out how we can help? That's great! Give us a call or send us an email and we will get back to you as soon as possible! Martin Wood Roofing provides free, no obligation inspections and quotes. We offer superior flat roofing services for commercial and private customers. With more than 25 years of experience, we know you'll get exactly the roof and service you need. Larklands Roofing provide professional Pitched Roofing Services across Derbyshire and Nottinghamshire. With many years of experience in the roofing trade, we have extensive knowledge in Pitched Roof Repairs, Tiled Roofing, Slate Roofing and Roofing Installations. Who we are, what we do and why we do it. We aspire to the highest standard of craftsmanship and quality. All work carried out by us is compliant with the relevant building regulations and in accordance with industry best practice in order to protect the integrity of your property value and the validity of your insurance. Our professionalism, together with our honesty and reliability makes us the roofers of choice for our customers, including some of Nottingham’s leading estate and letting agencies. To provide the best value to our customers and clients, our services are fully inclusive of sourcing competitively priced materials, scaffolding and any other equipment necessary to carry out the works required ensuring no hassle, no hidden costs or fees and a clear pricing structure. All our work comes with a ten year guarantee And we will take NO PAYMENT until you are 100% SATISFIED with our workmanship. We are a father and son family business with hands-on experience across a wide spectrum of construction types. Why our workmanship is the best. -Knowledge, experience and training The single most important choice you can make, is to use an experienced, time proven contractor, who can consistently tailor that material to your property, following British Standards. 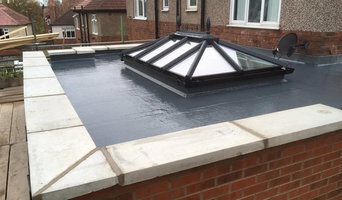 We only do flat roofs; all our work is to and beyond British Standard and we are proud to provide a personalised range of guarantees for your roof. -Highly qualified fitters -Elasto-plastomeric membranes designed just for flat roofs -All joints welded -No cold bridge mechanical fixings to corrode & fail -Safe non-slip surface -No rain rattle -Best-in-industry materials will expand and contract with building -Ultraviolet resistance; does not fade or degrade -Unique self healing qualities, found in no other membrane types -Various colours and finishes -Very long service lifespan -Exceptional value for money Industry Leading Elastoplastomeric Membranes If you are looking for repairs to your flat roof, thinking of re-waterproofing or have a new build project, we can help you with advice or offer alternative products tailored to your needs. B. Jarvis Roofing is a successful family run business with over 30 years' experience. We pride ourselves on delivering a wide range of roofing services across the Midlands, of the highest quality at a very competitive cost. All our work is carried out by CSCS certified operatives who have passed their CITB Construction Skills Health & Safety test. We are registered with Construction Line and are fully accredited members of Exor, a national database for pre-accredited contractors, which is a mandatory requirement to carry out works for Leicester City Council. We are also proud to be members of the Guild of Master Craftsmen. We offer competitive tendering and quality assurance, liaising closely with our clients throughout the project ensuring full customer satisfaction at every step. Quality and Health & Safety Our rigorous Quality Control standards and our excellent Health & Safety record are testament to the success of our business. In order to meet all our customers' requirements, we have a £10 million public and employment liability insurance policy enabling us to undertake projects of all sizes. All our work is supported with a guarantee of up to 30 years, depending on the type of roof installation, to give you complete peace of mind. We are fully committed to all matters of Health & Safety. All our work is carried out in accordance with HSE guidelines and backed up with full risk assessments and method statements. All our staff are fully H&S trained and we work closely with an independent Health & Safety consultancy to ensure the highest standards are maintained at all times. Marlite roofing and brickwork is a professional, family owned business, based in Nottinghamshire and Derbyshire and work solely on feedback from customers. Marlite roofing and brickwork have 23 years experience and specialise in all types of roofing, including new roofs, both slate and tile, storm damage and EPDM rubber flat roofing. We undertake all aspects of roofing both for individual domestic clients and commercial clients alike. We are a roofing company that is dedicated in ensuring that all our work is completed to the highest standard and quality with an excellent reputation with all of our existing customers. Marlite roofing and brickwork work diligently to ensure that we not only meet your requirements, but also exceed your expectations with our client based approach. Marlite roofing and brickwork are committed to providing the highest quality of customer service, honest guarantees and a proven track record for a successful domestic roof construction/repair, with 1000’s of roof repairs on domestic properties of all types and ages already completed. We offer a free, no obligation quote, a comprehensive evaluation of your roof/chimney/guttering or brickwork. The trust of the client is a priority for us, so, to ensure this, photographs of the problem areas are taken and shared with the client and an appropriate solution discussed, along with the price of the work which will be completed to the highest standard and comes fully guaranteed. Marlite roofing and brickwork offer; Marlite roofing and brickwork has worked hard to secure endorsements from the following regulatory bodies We are confident that you will be happy with our workmanship and your new roof, roof repair, chimney or guttering and to help alleviate any concerns we are always happy to provide references from customers and you can view these online by clicking on the logos above. TS Roofing Services For high quality roofing at low cost prices, look no further than TS Roofing Services. Based in Swadlincote, we are a family-run roofing business that has over 30 years of experience in the trade. All of our roofers are specialists in carrying out a wide range of services including new roofs, fibreglass roofs and lead work. A full list of the works we are able to carry out can be found on our services page. Contact Your Local Roofers in Swadlincote You can arrange a free, no obligation quote or find out more about TS Roofing Services by calling 07588 421817. Home Services Clients Case Studies Health & Safety Contact us banner1logo Based in Tamworth, Staffordshire, Elite Roofing & Cladding Limited are specialists in industrial and commercial refurbishment projects. We have the necessary skills and resources to take on any size of project large or small. We specialise in roofing and cladding projects, remedial repairs, emergency repairs and planned maintenance nationwide. We offer a friendly professional service to new and existing customers. Elite Roofing & Cladding Limited are members of the Confederation of Roofing Contractors and Safecontractor schemes. Why should I hire Nottingham, Nottinghamshire roofers to handle my roofing and guttering? Although it may require some additional investment, working with roofing contractors will mean you have a reassuringly deep bank of knowledge to draw upon when it comes to what action is taken and which materials are most suitable. Do you need a full roof replacement or can it just be patched? Should you use EPDM proofing, invest in fibreglass roofing or consider metal roofing? Will the roof structure support your chosen roofing material? Do you need gutter cleaning or to have your gutters replaced? Roofers can also advise you on more specialist areas such as roof insulation and rainwater harvesting. What roofing material should I choose? There are a wide variety of materials available and your Nottingham, Nottinghamshire roofers can help you decide which option is best. You might look at clay, slate or concrete tiles and your choice will depend on cost, the style of your home and the local roofing style. In the North West of the UK you will see a lot more slate tiling, whilst in the South East there is an abundance of clay roofs. 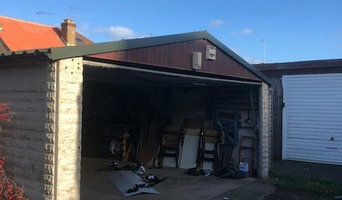 If you are in a conservation area you may find that your choices are more limited and you may need to look for reclaimed tiles; local Nottingham, Nottinghamshire roofing contractors will be knowledgeable in this area, so ask for their advice, too. How do I find good Nottingham, Nottinghamshire guttering specialists and roofers? Search for Nottingham, Nottinghamshire roofers and gutter cleaning specialists in the Find a Pro section of Houzz. Read their profiles, try to match their core skills with the problem in hand – some specialise in flat roof repair using roofing felt, others only work with roof tiles – and then see what previous customers have to say about their quality of service. Ask for personal recommendations from friends and family. Ideally your shortlisted roofing and gutter specialists or experts are members of the National Federation of Roofing Contractors (NFRC), the Guild of Master Craftsmen or the Federation of Master Builders (FMB). Each trade organisation demands a high level of expertise and imposes a code of conduct on its members. TrustMark is a government-endorsed scheme that independently assesses tradespeople and allows you to lodge a complaint if necessary – look out for that. Call them round for a consultation and make sure you request a written quote. Cheapest is not necessarily the best; more importantly, who can you work with? How long have you been a roofer and how many projects like this have you completed? Please can I speak to a few previous clients or read references? Please can you talk me through the different stages of the job and how long it will take to complete? Is your proposed solution in accordance with local building regulations? How much disruption will there be? Should it be a repair or a full re-roof? What materials would you recommend for my roof? Should I consider clay tiles, concrete tiles or slate tiles? Do you carry out gutter cleaning services too? Or will you replace all my gutters? Is your quote inclusive of VAT and all materials? Is your work under warranty? If there are problems after completion, will you address those free of charge? Find Nottingham, Nottinghamshire roofers and gutter cleaning professionals on Houzz. Narrow your search in the Professionals section of the website to Nottingham, Nottinghamshire roofer or gutter specialist. You can also look through Nottingham, Nottinghamshire photos by style to find a roofing project you like, then contact the specialists or roofing contractors who designed it.